"An extraordinary cottage tucked away in such idyllic settings." Relax on the cottage lawn. Located between Brecon Beacons National Park and the Gower Peninsula in South Wales, this cosy countryside cottage combines a beautiful and tranquil setting with proximity to amenities and attractions, making it a truly exceptional holiday retreat. 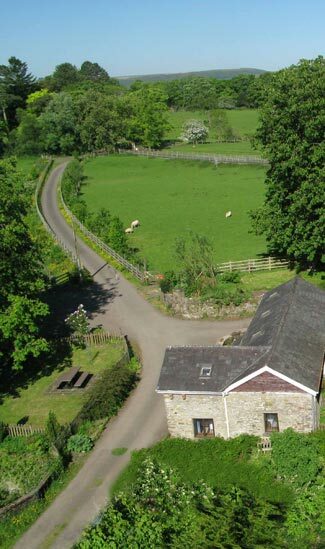 Unlike many other self catering cottages on the market, Bwthyn y Saer comes with over a hundred acres of private grounds which guests are free to explore. This is a cottage that allows you to have your cake and eat it – a wonderfully tranquil countryside setting, with attractions and amenities on the doorstep – there is even a large 24hour supermarket (beginning with the letter ‘T’) just over a mile away in the town of Pontardawe, although you would never guess when relaxing back at your cottage. A flock of Welsh mountain sheep pass by the cottage sun terrace. Accommodates 2 to 4 people. Contemporary wet room. For disabled guests, there is ample room for a wheelchair to turn. Open plan kitchen/diner/lounge with corridor leading to large bedroom. Bwthyn y Saer is an eco-friendly cottage. Private parking on the courtyard alongside the cottage.